Just when I think I’m back in, they pull me out. On January 2nd, my computer got attacked, for all intents and purposes, was destroyed. Fortunately, I was able to get my parents old computer a few days later, to get me by until I can get myself a new computer. After a few more days, I was finally able to get back online. The reason it took so long… may have been accidentally self-inflicted, but that’s neither here nor there. So I was all ready to jump back into blogging regularly after finally getting back online (something like 11 or 12 days ago at this point), when I discovered that all the old scans of mine leftover on this computer, and the more recent ones I saved the emails to… I can’t edit them into smaller chunks on this computer. Not in any way that I can remember anyway. So I’m still not back yet I guess, and won’t be for at least a little while longer. I saw a pretty good computer (with glorious hi-def monitor included!) that I can afford by February if it or something like it is still available at that price, or deity of your choosing-willing, less. But cards?! It’ll be a loooong time before I can afford anything very meaningful on that front again. 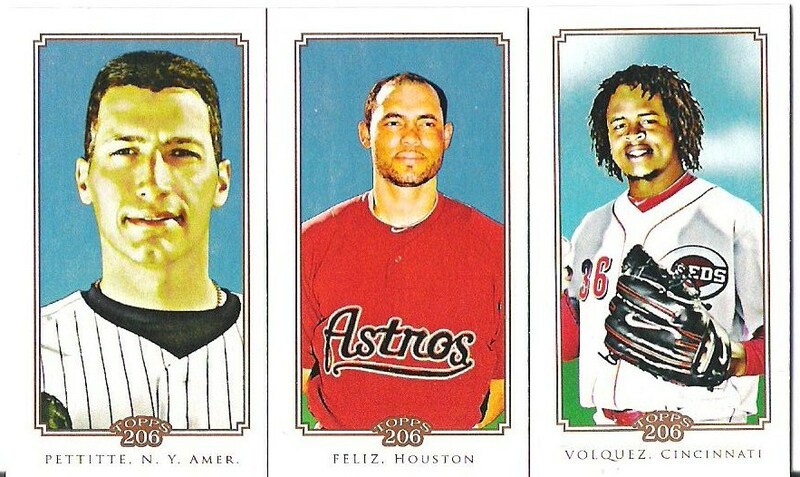 A couple cheap packs here & there perhaps, and maybe I can squeeze in a group break or two, and the rare (yet somehow disgustingly not rare enough) visit to eBay, but I’m cutting my card spending by at least half. Video games have been loudly calling my name again, so I’m looking at a PS3, and I could use a laptop too. In other words, the ol’ budget’s gonna be tighter than an analogy I’m too distracted to make. Fortunately, I still have loads of cards to get rid of, and will still have way too many even after all the trades I’ve let my end down on for way too long are at long last taken care of. As far as the blog goes, I’m not back, but I’m not entirely gone either. I have something like a three post buffer from before my old computer got torn a new one, and just enough edited down to size scans handy for a couple more if I get a minute. You’ll start seeing all that jazz soon. Until then, I’m Pro Bowl Shufflin’ outta here. Tagged can't afford cards now, computers are fickle mistresses, Epic Fail~!, fail!, I call shenanigans., I'm an idiot, nincompoopery, ripoff!, self-inflicted wounds, What? Me behind on trades again? Surely you jest. Awhile back (mid-November I think) I picked up some blasters at Shopko. All $20 ones were on sale for $14.99, and I had a thing for $10 off a $40 or more purchase, so that knocked an extra $2.50 off each of the four I picked up, making them $12.50 apiece. They were all 2010, topps206, topps Heritage, topps Chrome (all baseball), and Bowman Platinum (football). So here’s a look at what I pulled from 206 and Heritage. We’ll do the Chrome and Platinum another day. 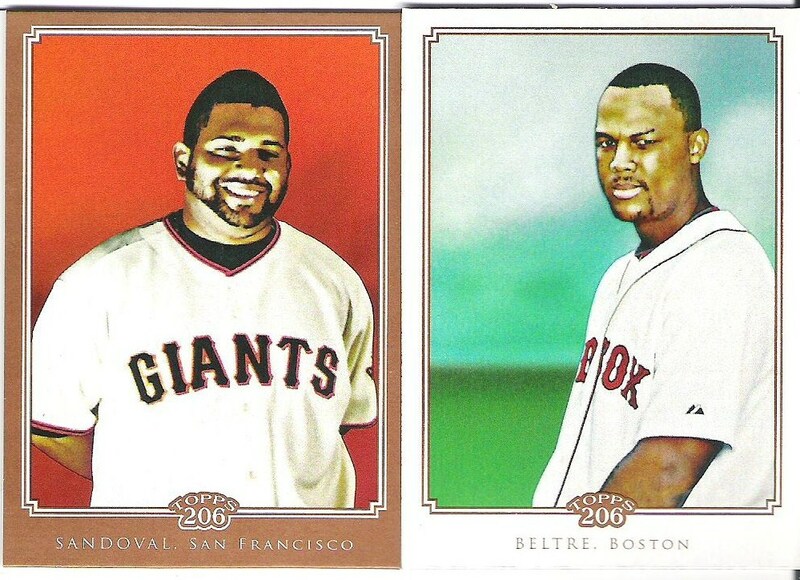 My only two probable keepers from the 206 blaster..
A few of the better bronze parallels. Might keep Cueto due to the epic hair on display. 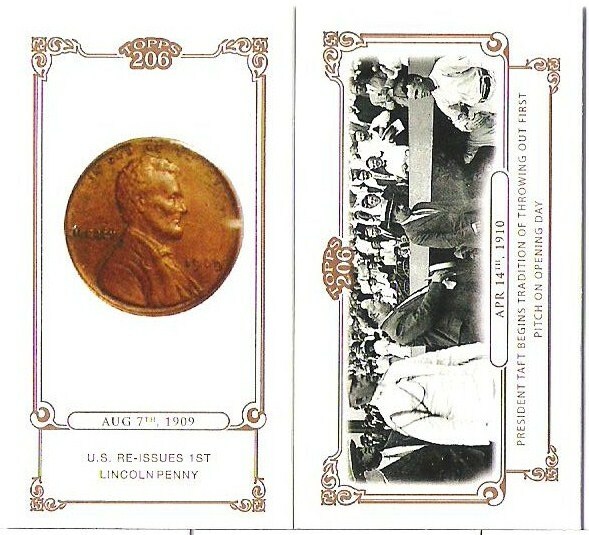 A mini penny and a history card that’s actually baseball related. 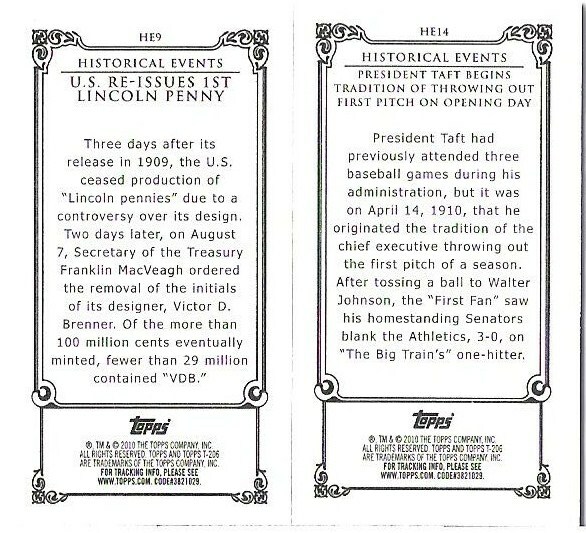 The backs of the Historical Events cards for those that care.. 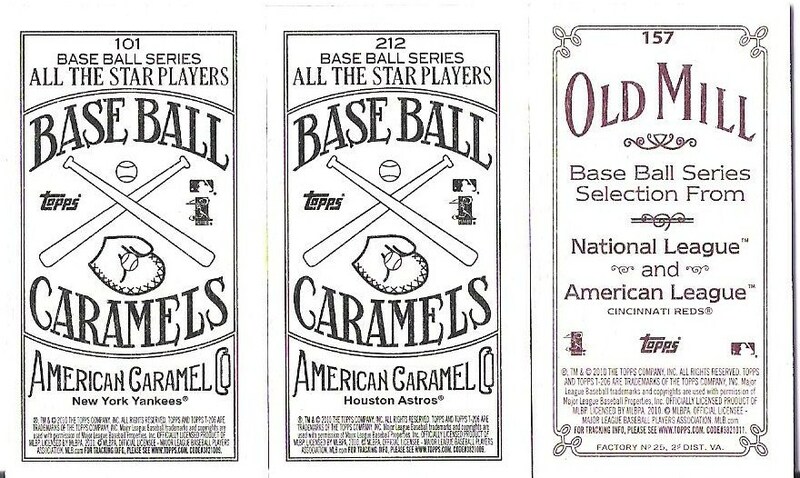 The Baseball Caramels (Pettitte/Feliz) backs are 1:4 packs I guess. The Old Mill (Volquez) is something like 1:20 or 1:22. Not a great blaster, but the the price being 37.5%-off helped. 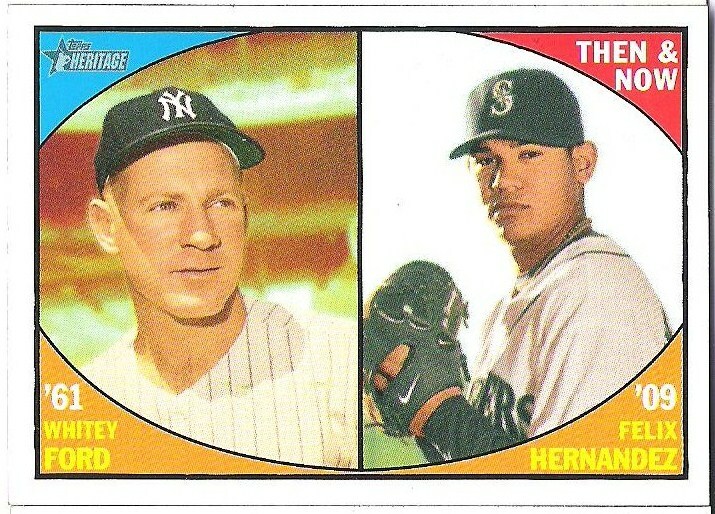 Oh yeah, there was a King Felix base card that I’m too lazy to finish editing down to size that I’m keeping. Also not pictured, Mike Leake RC, and hat SPs of Ryan Braun and Mantle. 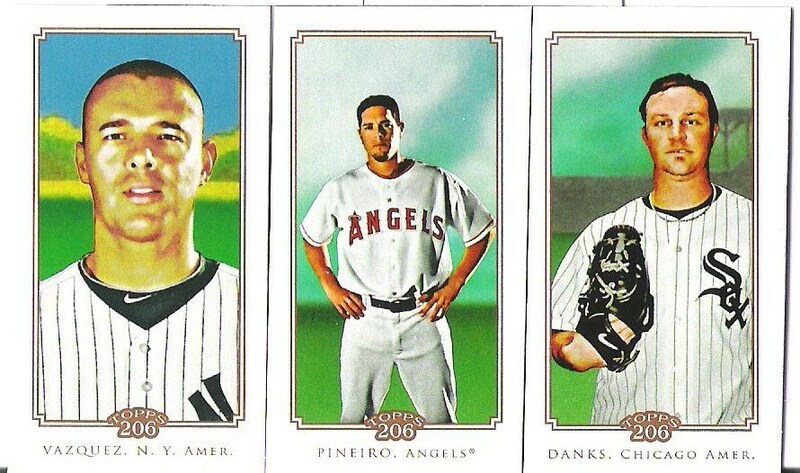 Now then, onto the topps Heritage. First up, some Baseball Thrills. Might keep a couple of these (Hornsby is going to Cards on Cards) unless someone else wants them. 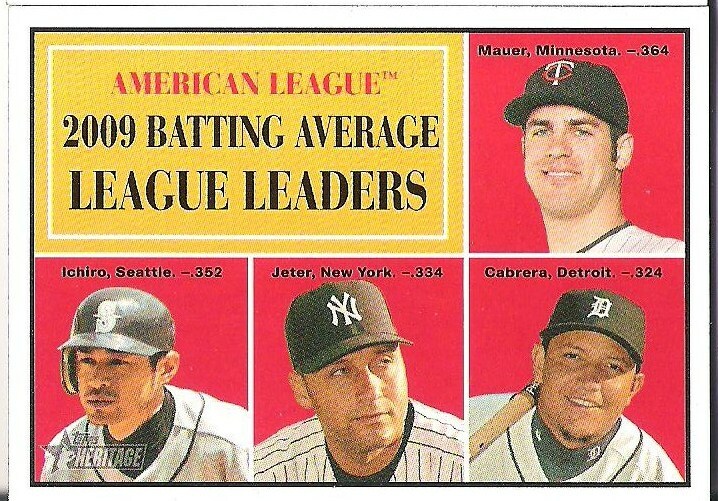 Lots of star power on this one, and a keeper on account of the Ichiro-ness. My other keeper. Then & Now Whitey & The King. 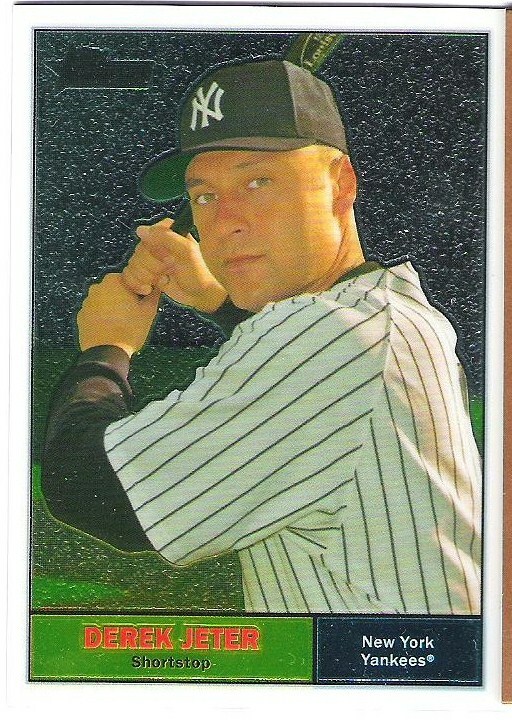 Finally, the big hit of the blaster, a Jeets Chrome #’ed to /1961. Not the greatest blaster, but much better than the 206, for the better keepers from more important personal collections and a better best pull at least. Seeya next time, when I either get back to the Check Out My Cards stuff, do a trade post, or the second part this with the shinier blasters. Maybe I’ll even do my best pulls of 2010 list, but probably not. 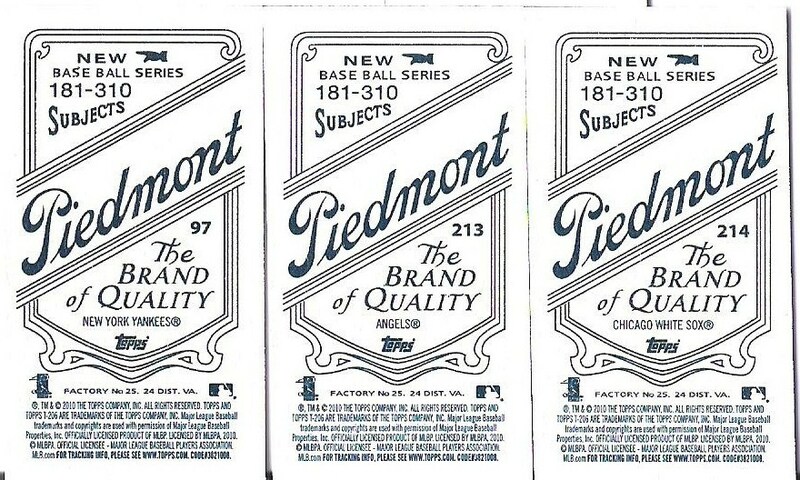 Tagged 1961, 2010 topps Heritage, 2010 topps206, a penny, Adrian Beltre, American Caramels, Baseball Thrills, Batting Average Leaders, blaster breaks, blaster sale, Carlos Delgado, Christy Mathewson, chrome, Derek Jeter, Edinson Volquez, Felix Hernandez, He Del-got-it, Historical Events, Ichiro, Ichiro Suzuki, impossible feats of baseball acumen, Jeets, Joe Mauer, Johnny Cueto has magnificent hair., keepers, King Felix, Kung Fu Panda, Mariano Rivera, Miguel Cabrera, Miguel Tejada, minis, Neftali Feliz, not pictured, Old Mill, Pablo Sandoval, Piedmont, President Taft, Rogers Hornsby, shortprints, SPs, star power, tag overload!, Then & Now, Tom Seaver, topps News, Walter Johnson, Whitey Ford, Whitey Whackers, You should care about history!